On Tuesdays we are thrilled to fling open the doors to all of YOU! We love hearing your dreaming stories…the lessons you’ve learned, the roads you’ve walked, the dreams He’s planted in your hearts! 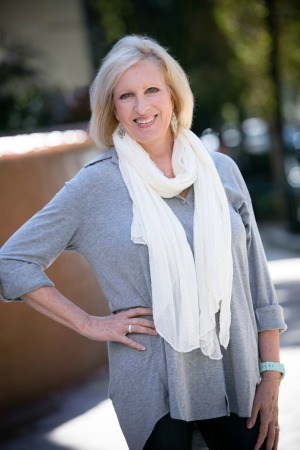 Today we are excited to welcome Kate Battistelli to God-sized Dreams. She shares some sweet encouragement about the extraordinary that can be found in a life lived for Him…we know her words will bless you! I want to do big things for God, leave a legacy, live a life of impact. But is it necessary to do big things for God or is it better to do small things with great love and see where God takes it? Jesus calls us to be salt and light, to live a life well-seasoned and walk a path well-lit so others will follow. But what if the path He gives me is the obscure path? The quiet, gentle path? Does that match up with what Christian culture tells me I should want? Hmmm. A quiet and peaceful life that pleases God and draws others to the truth. A life that lacks nothing. But a life leaving a pleasant fragrance and an example to the unbelievers all around us. Sounds like an unknown, obscure life to me. But it sounds like a God-Sized Dream and a world-changing life also. In this generation of online notoriety, YouTube sensations and 15 minutes of fame, who among us is content to lead a quiet life? We are compelled to ‘go into all the world’ and to do big things for God. We aren’t encouraged to lead quiet lives because we mistakenly think those kind of lives will have no impact. But we couldn’t be more wrong! Our culture is over-saturated with a ‘look-at-me’ mentality. We think it’s necessary to go and do and achieve when really, maybe all we need is to live like Christ. To live the Extraordinary Ordinary in the everyday. Jesus did the simplest of things and imbued them with meaning and deep importance. He washed feet, healed the blind with mud and spit, fed thousands with bread and fish, lived, ate and slept among a small band of men who decided to follow His example. He started with 12 simple men and turned the world on it’s head. What if we lived a ‘look at me’ life in the ordinary, day after day sphere, sprinkling salt and shedding light to our families and neighbors? What if the God-Sized Dream God has for you doesn’t involve numbers and followers, stats and likes, beyond your family and neighborhood or workplace and church? 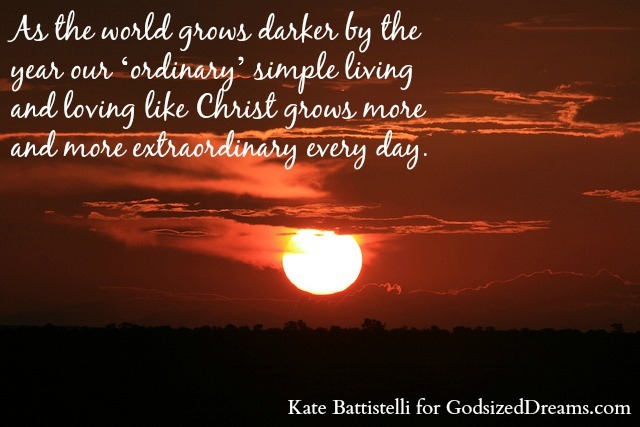 As the world grows darker by the year our ‘ordinary’ simple living and loving like Christ grows more and more extraordinary every day. It takes extraordinary dedication to raise your children year after year to know God, to love Him and follow Him all their lives. It takes extraordinary determination to fight for your marriage when the world says give up and move on. It takes extraordinary faith to give to others unselfishly expecting nothing in return. It takes extraordinary diligence to work at your job as faithfully and honestly, unto the Lord and not unto men. It takes extraordinary love to maintain your stance year after year yet as your light shines brighter and your salt seasons more effectively, you change the world in your obscure little corner of the world. It takes extraordinary love to bless those who curse you, to pray for those who’ve hurt you. It takes extraordinary discipline to not give in to what the world calls good when you know it’s bad. It takes extraordinary compassion to love your neighbor and serve him whether he’s Muslim or Hindu, trans-gender or divorced, straight or gay without judging or trying to convert him but simply loving the way Jesus loved. Those are God-Sized Dreams each of us are called to. The attributes that may be ordinary for you–courage, fortitude, faithfulness, generosity, diligence–look extraordinary to those who are watching. And believe me, they are watching. Those who follow, our children, neighbors, co-workers and friends will see our light and taste our salt and want to know why we have peace in the midst of trials. Why we have faith when chaos rules. How are we able to live with courage and not fear when everything tells us to be afraid of the future. How we’re able to love the unloveable and serve the unworthy. That’s a God-Sized Dream I can wrap my head around. Kate’s an ‘empty nester’ who’s been married to Mike for 30 years. She’s the mother of recording artist Francesca Battistelli and Mimi to Franny’s two children, Eli and Audrey Jane. She’s a Jersey girl currently living in Atlanta writing about God, food, family and hospitality. Before becoming a Christian, Kate was an actress and singer in the New York Broadway musical theatre world. She toured for nearly three years in the Broadway National Tour of The King and I playing Anna opposite Yul Brynner as the King and it’s where she and her husband ‘fell in love across the footlights’. Kate loves creating and sharing easy recipes using whole foods and organic ingredients and writing about and pondering the goodness of God. She’s the author of Growing Great Kids-Partner with God to Cultivate His Purpose in Your Child’s Life, published by Charisma House and she blogs about food and faith at KateBattistelli.com. She’s also a contributing writer to MothersofDaughters.com, and TheBetterMom.com You can follow her on Twitter, Instagram, Pinterest and Facebook. Her second book, The God Dare, will be released Winter 2014. Thanks for such an inspiring post, Kate. We live out our ordinary lives for an extraordinary God. I love this: “Jesus did the simplest of things and imbued them with meaning and deep importance…” I want to have that same vision as I cook, grocery shop, and mop the floor! Kate, when I think of those who have made a lasting impression on my life, it isn’t the big, well-known personality. My neighbor’s mother just died. I just recently saw her again, but I have vivid memories of this loving lady from when I was a small child and we went to church together. That was a loooong time ago, but she was salt & light. It made an impact bigger than her reach or platform. That’s what I want to be to others. That’s exactly it Amy. The things we think are small can have a huge impact in another’s life. Little is BIG in God’s kingdom! Hugs! I’ve been thinking a lot of the ordinary lately, and this post just confirms what I’ve been feeling. Great post, so glad you are guest posting! Thanks for writing this, Kate. Many of these same thoughts have been on my mind lately. I’m convinced that God wants our obedience in the every day more than our reaching for those “big dreams.” Our faithfulness will bring us to God’s dreams for us. Kate, thank you again. So very blessed by your words here today! I have struggled with time and time again of not “being” enough. Of feeling like because I don’t have a missionary calling that what I do day in and day out doesn’t matter as much as if I did. This post reminds me that I can have influence in my corner of the world, regardless how “small” that arena may be…it is still important!! Kristin–it is SO important! You ARE a missionary, to your family, neighbors, friends and the online community where your words are seen in all sorts of far-flung places! The thing is, it’s not so much about what we DO for God as just knowing and delighting in Him, wherever He puts us and whatever He puts in our hands to do for Him. It doesn’t matter if it’s changing diapers and doing laundry or preaching to thousands. What matters is knowing Him and making Him known. Letting people experience His light and salt pouring through our lives. Truly, the more I just press in to know Him, the less any of what the world says is big or important matters to me. You are a beautiful light already. Just keep shining for Him! Hugs! You’re so welcome Christine! Blessings! What good encouragement for me today. 🙂 My husband and I, along with our 3 youngest out of 6 kids just moved back to the Czech Republic as “missionaries”. Many people ask us what our ministry is/will be here. The Czech people are 90% athiest. It is a very dark place spiritually,morally and sometimes also emotionally. We are here to build relationships with people, so we can shine the light of Christ and sprinkle the salt of His truth into their lives. Sometimes that means teaching English, or letting my daughters participate in middle school and high school English conversation classes so they can impact peers there, or talking with other “futbol” (soccer!) parents at practices and games, or having people over for dinner and conversation, or explaining why we are here in a way that encourages our Czech friends rather than demeaning them…It’s being faithful to my husband and rallying support for my state-side kids when loneliness or college overload causes them to call us in the middle of our night in tears. Well, we’ve actually called them in tears some nights, too. But even those tears and heartaches are our sacrifice to God. We seek to honor Him by saying that His message, even shared humbly, in this small corner of the world, is well worth the sacrifice of separation from our dear ones for this time. About a month before we left to fly over here, God allowed me to witness my 18 yr old son giving his bag of snacks to a homeless man. He had packed these for his week of work at his grandpa’s rural farm. Wow. I think God was letting me see an encouraging evidence of Joshua’s spiritual growth, and God’s preparation of him for this time away from us. So, thank you for the good word of perspective and encouragement! May we all press on faithfully in walking with our Savior even as the world around us grows darker. Our confident hope is in Him. Pamela, I keep reading over your words and thinking, “Yes! That’s it EXACTLY! !” I absolutely love what you and your family are doing in the Czech Republic. Your lives are bright flames of His love & truth in a dark part of our world that so desperately needs Christians to just show His love in the everyday. You truly are extraordinary and I’m so blessed by your words today. If you’re willing, I would love your permission to use some of your comment in a future post. I would be happy to keep you anonymous and even change the country if you wanted me to. Let me know if you’d be comfortable with that. Hugs to you my friend! Keep shining!! Hello Kate! I began to reply to you yesterday, but that got lost I think. Thanks for your words of encouragement! You may publish any of my comments that you want to. There is no security risk here, so you don’t have to worry about my name or the country name. Thanks for checking though. My sister in NYS forwarded your piece on to me for our encouragement and I plan to forward it to our oldest daughter and her husband. They minister to at -risk children and teens in the inner-city of Elkhart, Ind. with a ministry there called Lifeline Youth Ministry. Your article also describes exactly the methods and mindset there. They live right across from the gym complex where they do athletics instruction and leagues, homework tutoring, Bible clubs, evening meals and just providing a “safe haven” for the kids. They were married last Dec. and God is giving them a good steady loving ministry there.